BoKlok Solhöjden, Huddinge is the 2nd development carried out by the BoKlok in the vicinity of BoKlok Visättra Ängar. 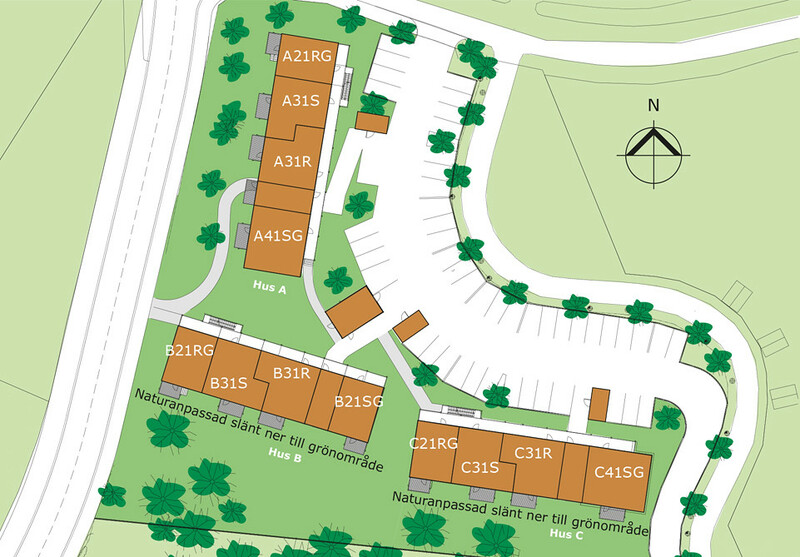 In the original bidding process by Huddinge municipality marked both of these development are branded as one area “Område 4”. BoKlok Solhöjden is a BoKlok Flex style flats and consists of 48 apartments on four floors. The Draw of apartments was help on Tuesday 2nd September 2014 in IKEA Kungs Kurva between 17:00 and 19:00. The draw method was as usual BoKlok and total of 120 numbers were marked. On Monday 8th March all the winner were called at 18:00 and to select the apartments turn by turn and signed the contract. These 48 apartments are divided into 16 apartment in each Block, where each Block A and C consist of four 85 kvm, four 55 kvm and eight 75 kvm apartments. In Block B there is no 85 kvm apartments and it consist of each eight 55 kvm and 75 kvm apartments? The main issue with Block A is that its first floor elevation is below to the adjoining road, which is potentially deal breaker for many people. And Block B and C are three meter below elevation to Block A. The another concern was that some people were not aware that on the back side of Block B and C is another BoKlok Visättra Ängar and they thought there is only green area. In contrast to Visättra Ängar, the interest was not very high and lot of people were not shown up, after the meeting few apartment were still left to be sold. Copyright © 2019 blog.azee.se. All Rights Reserved. The Arcade Basic Theme by bavotasan.com.